Re-excavation by Gillings & Pollard was conducted in 2014-15 as part of the 'Between the Monuments' project. Anthropologist Lionel Sims has explored the issue of supposed male/female-shaped stones in great detail. The Alexander Keiller Museum has in its archive a fascinating typed manuscript by OGS Crawford, detailing his work of many years on the West Kennet Avenue. It was probably intended to be a chapter of Crawford's book, which sadly never came to fruition. In 2011 I re-typed the m/s into a Word doc. With my added comments it may be downloaded as a pdf here: CRAWFORD WKA Thanks to The Alexander Keiller Museum, who hold the m/s. At the S end of Keiller's restored section of the Avenue, there are two further anomalies that should be mentioned. One concerns stone 33b, which was still standing when Keiller arrived; it was stabilised with concrete, but is still in its original position. 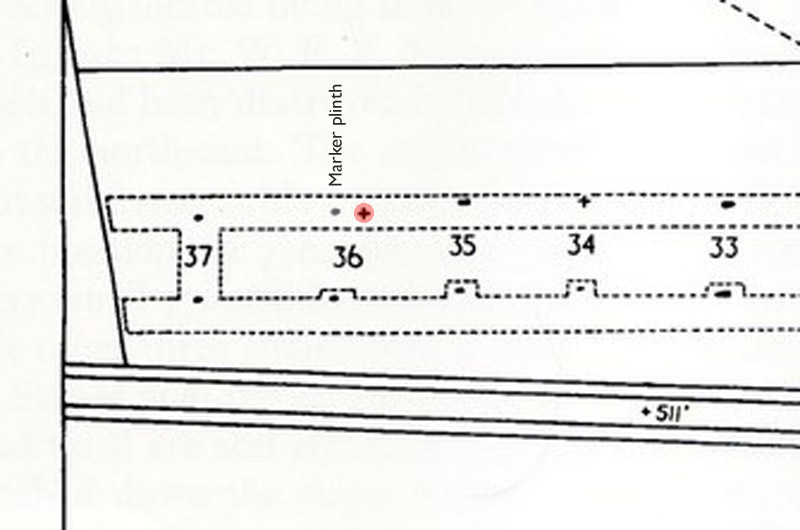 Stone 33b, unlike all other stones of this section, is not mounted with its long axis in line with the setting, as it is shown on Smith's plan (below) but is skewed around 15 degrees to the west (anticlockwise). Why? 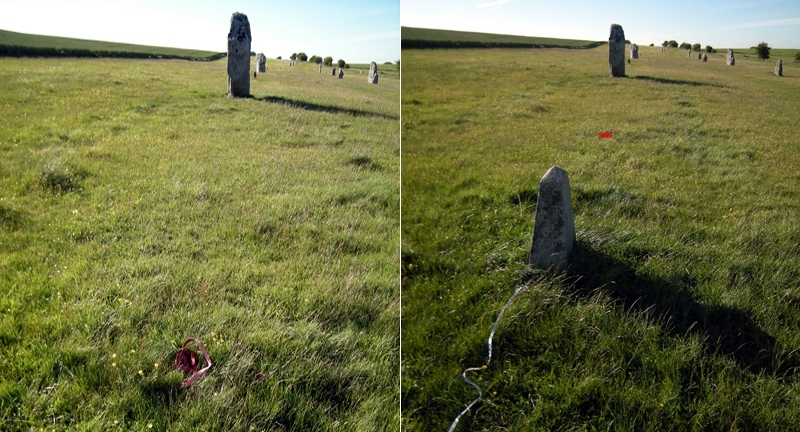 We have no idea, but as other stones inside the Henge are similarly skewed, it must be assumed this is deliberate. Perhaps it is an astronomical, or some other significant alignment? There is also some doubt concerning the position of the missing stone 36b. The Keiller/Smith plan of the restored Avenue shows the marker plinth of 36b as being out of line with its partner 36a: it is much closer to 35b than 37b. 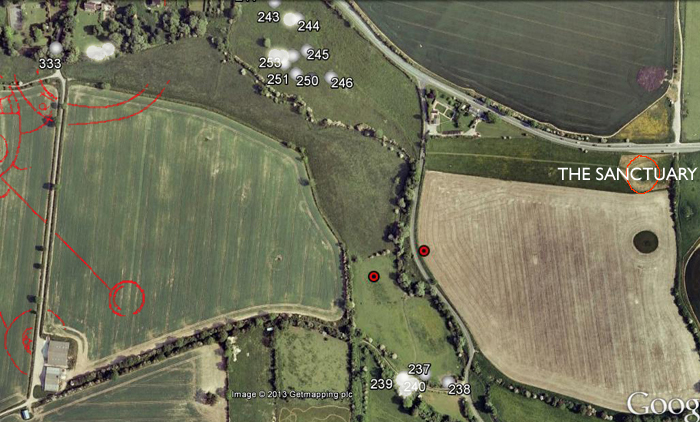 But visit the site today and 36b's marker is clearly not where the plan shows it, but equidistant between 37b and 35b. On measuring, I found it to be exactly 80 ft from each of the adjacent stones: as 80 ft is the average spacing along the Avenue, this suggests that there was some doubt about the true position - some markers inside the Henge were position by average spacing when their sockets had been destroyed. Keiller's excavations began at stone pair 37 and worked towards the Henge, so it seems likely that the socket of 36b was wrongly identified and its position estimated later. The discrepancy is considerable. 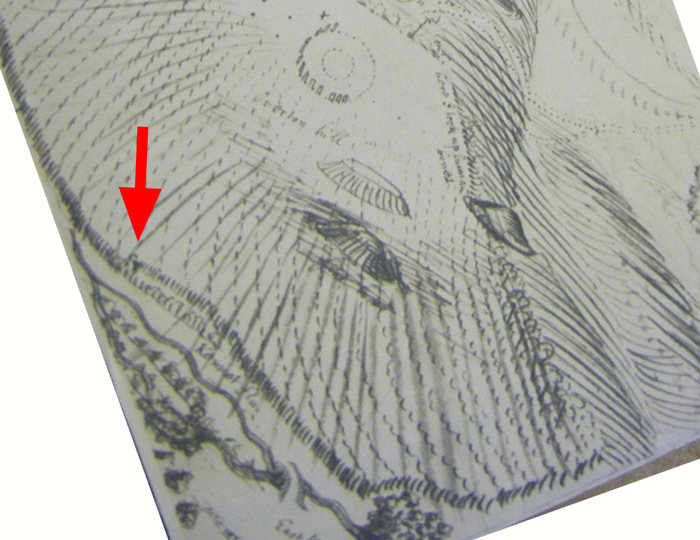 The marker plinth for Stone 36b is sited around 5.8 m, or 19.9 ft, SW of where it is shown on Isobel Smith's published plan; this can be easily confirmed by overlaying Smith's plan (below) onto Google Earth. Below: Both pics facing NW to Stone pair 35. Page 99 - Did the West Kennet Avenue really run continuously from the Avebury Henge to the Sanctuary? 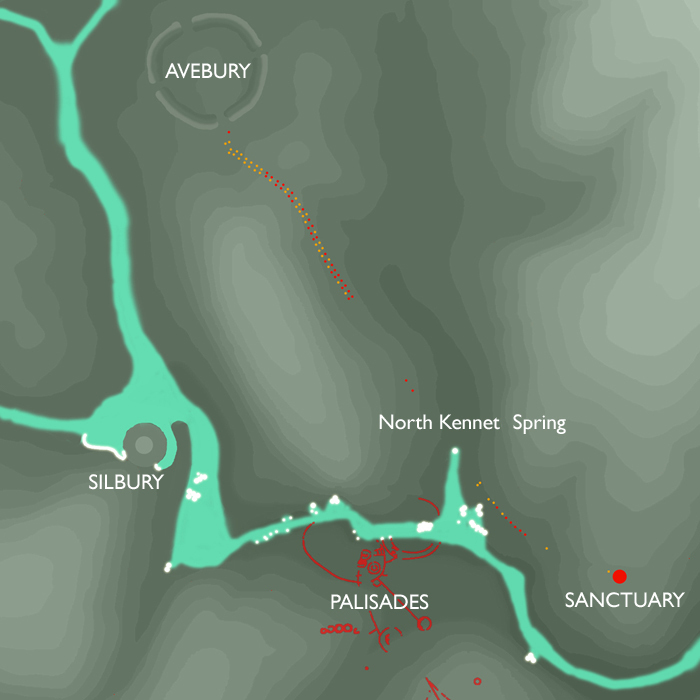 The WKA's course from the Avebury Henge to the Sanctuary is assumed, with little evidence to support it. There has long been an assumption that the West Kennet Avenue (WKA) originally ran continuously from the Avebury Henge to the Sanctuary on Overton Hill. But did it really? In 1723 Thomas Twining published a rather peculiar map of Avebury (below), showing two avenues extending from the Sanctuary. One ran NW to Avebury - presumably it was the WKA - but a second avenue ran W to cross the river Kennet. Twining believed that Avebury was a Roman temple dedicated to the god Terminus and that the avenues were processional routes that he described as a 'circus' and a 'discus'. The map is wildly inaccurate; AC Smith commented on its 'absurdity'. Although some of the features are probably imaginary, the portrayal of a avenue running W from the Sanctuary to the river Kennet is perhaps worth further investigation. When Twining published his map he was the vicar of Charlton in the Vale of Pewsey, some distance from Avebury, so his inaccuracies could perhaps be attributed to an unfamiliarity with the area. But this was not the case: Twining must have had considerable local knowledge, for in the 1690s he had spent several years as the curate of Christ Church, East Kennett (B. Edwards, Pers. Comm). In the early 1920s OGS Crawford spent considerable time and effort on researching a route for the WKA from the Avebury Henge to the Sanctuary. As well a written report (possibly intended for a book that was never finished) his findings were drawn onto a 1900 edition OS map at the huge scale of 6" to the mile. Apart from his extensive fieldwork, Crawford's main resource was a pair of panoramic Stukeley drawings acquired by Keiller, large photographic copies of which are also in the archive along with Crawford's work. 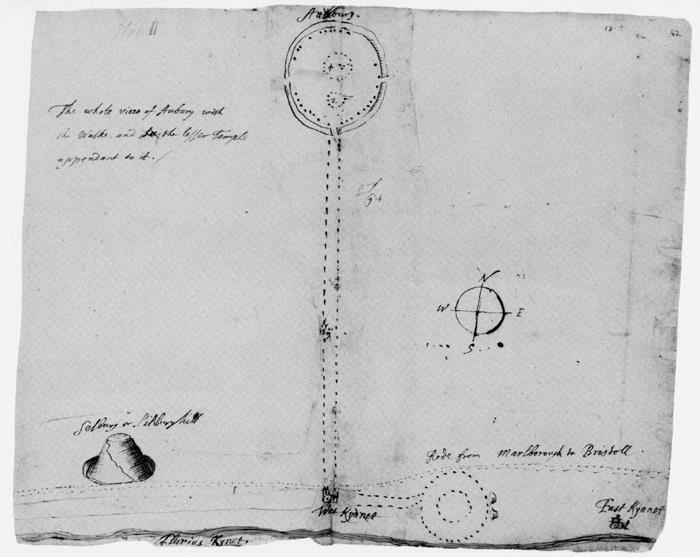 Stukeley's drawings, apparently made in the field, show standing stones, the positions of stones recently taken away, and the estimated positions of other missing stones. One drawing is in pencil: Crawford referred to it as 'the main plan'. The other drawing, in pen and ink, was believed by Crawford to be an earlier, rougher version which he named 'the variant'. 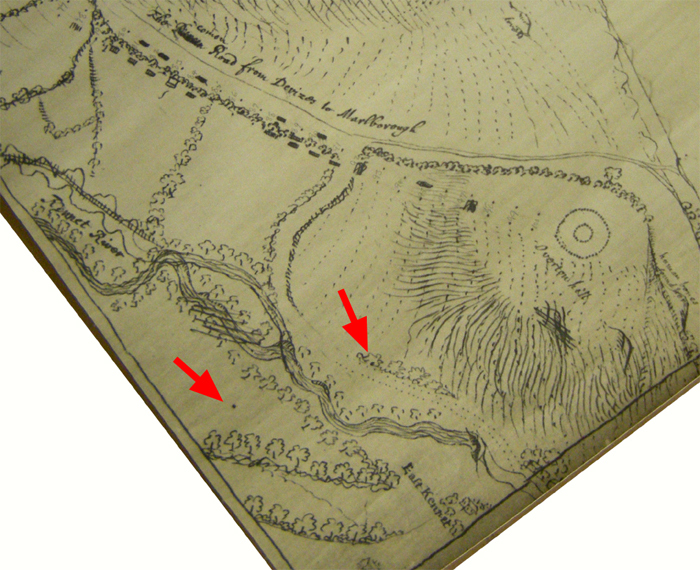 On both plans Stukeley had difficulty capturing the shape of the river between East and West Kennett, as there is much crossing it out and redrawing. Stukeley's final rendition of the river Kennet appears to be accurate, as it closely matches what we see today. His two drawings also show what seems to be a stone (represented by a large dot) by the side of the road running S into East Kennett from the A4. It may simply be a milestone, though on the 'main plan' it is labelled C, rather than MS. 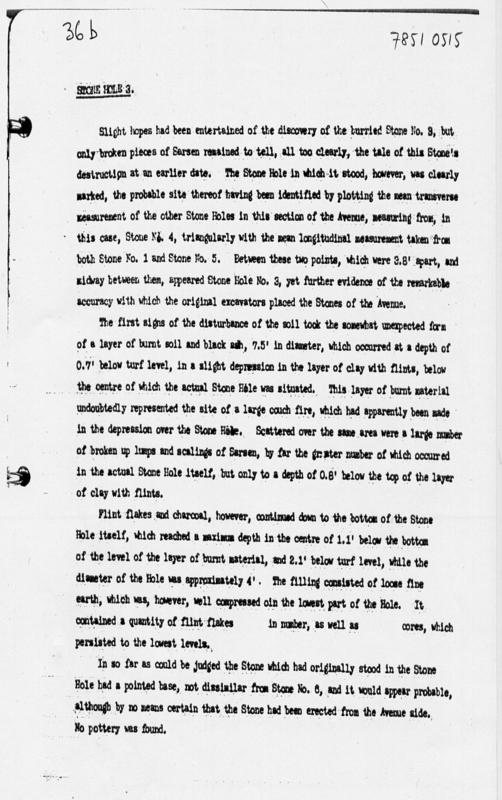 The plan has a legend explaining various other letters and symbols, and there is no C. The plan's bottom edge extends only just to the river but the 'variant' plan shows fields some distance beyond and indicates another stone (assuming that is what the large dot signifies) to the W of the river. Could it be that Stukeley had recorded the last survivors of Twining's western avenue running from the Sanctuary to the river, and possibly beyond? 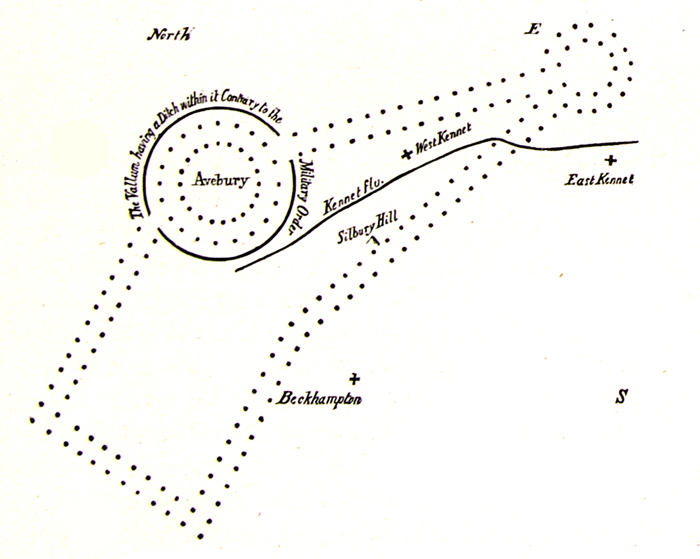 The earliest recorded plan of the WKA was made around 1660 by John Aubrey; it shows an avenue running due south from the henge towards the River Kennet, and stopping short at West Kennett. From there, at right-angles, another avenue runs due east to the Sanctuary. There is a distinct gap between the two avenues. Aubrey noted that the eastward run crossed the river; this is assumed to be a mistake as the avenue, as perceived today, does not cross the Kennet. So why did Aubrey think that it did? Aubrey's well-known 'discovery' of Avebury whilst hunting was in January of 1649, when seasonal springs and rivers would likely have been flowing. Stukeley visited Avebury six times between 1719 and 1724; his notes and drawings suggest that he was there only in the spring and summer months. Unlike Aubrey, Stukeley was not local to Wiltshire. For him, the journey from East Anglia was a major undertaking, one not likely to have been made in the winter. So it is possible that Aubrey may have seen rivers that were dry on Stukeley's visits. Aubrey did not state which river was crossed by the avenue, yet from his admittedly stylised plan it clearly was not the Kennet. There is a possible contender - a river that no longer exists but is still shown the current OS map. On the N side of the A4, at the junction with the B 4003 to Avebury, is a yard attached to West Kennett Farm. The OS map shows a tiny river running SE across the yard; on older maps it is marked as 'drain'. The river is shown to start (SU 11198 68515 51°24.932'N, 1°50.422'W) at what was almost certainly once a spring; it ends abruptly where it has probably been channelled underground, to flow S under the A4 and into the river Kennet. The farmyard has always been notoriously wet, as confirmed by residents living close by; they also recall that the water once flowed into the Kennet. The yard is still often wet today, though there is no stream as the spring has likely been capped. If Aubrey really did see a river crossing the avenue's eastward course, its most likely source would be this one, which for convenience I have named the North Kennet Spring. What physical evidence is there for a continuous avenue from the Avebury Henge to the Sanctuary? The map below starkly illustrates how little there is today. Adapted from Landscape of the Megaliths, the red dots show existing stones and the yellow dots the sockets of missing stones found by excavation. At least half the avenue is conspicuously absent. 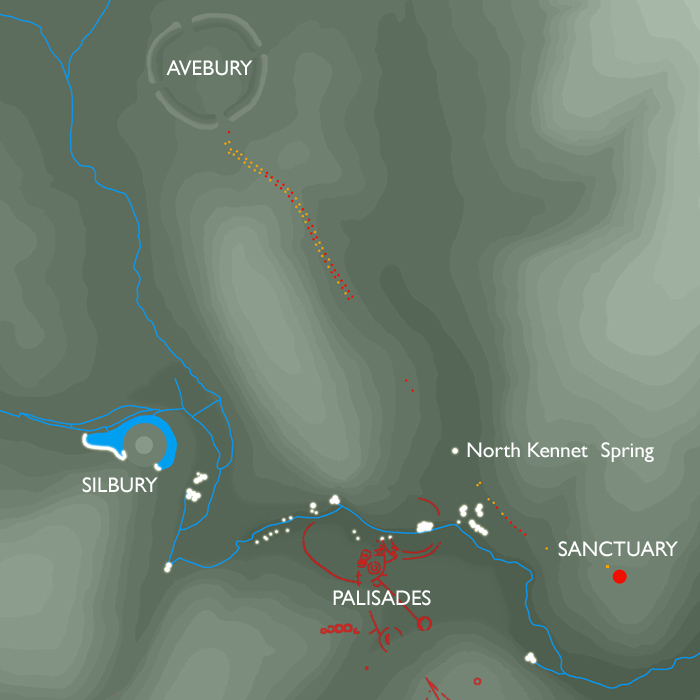 Aubrey's plan shows an avenue connected to the henge, and another avenue connected to the Sanctuary, but the two are not actually joined: there is a significant gap at West Kennett. By Stukeley's time many stones had already been removed and his plans show many gaps, including that at West Kennet. A geophysical survey of part of this missing section was inconclusive: the only stone found was one shown on the OS map of 1883. (LOTM p.132) This all suggests that the avenue was not continuous, and that there may always have been a gap at West Kennett. At the centre of that gap, exactly on its projected course, is the North Kennet Spring (below). The river Kennet's modern course is not natural but has been heavily managed at some time, possibly in the medieval period. Flowing as it does, across flat areas of low ground with a gentle gradient, the river should be wide-spreading and probably braided, with areas of marshland between and around the braids. This is exactly what we see today in unmanaged sections of the Kennet, such as between Fyfield and Manton. From north of Avebury to just beyond East Kennett the river management is particularly evident. The 5m contour steps of the OS map are too coarse to properly show this, but walking the riverside meadows with an altimeter reveals where the water would naturally flow. Because the gradients are so slight, and the meadows so flat, the river should spread over an area between 100m and 200m wide; instead, it has been confined in a largely man-made channel of no more than 3m. For much of its course the Kennet has actually been forced uphill to the edges of the meadows and now flows along an artificial course a metre or more higher than it would naturally. Moving and confining the river has turned large areas of formerly unusable marshland into valuable pasture. The contour map below gives some indication of how the river may have appeared in prehistory, before its management. The light blue areas show the probable extent of marshland. Through this the river would have flowed - generally not as a continuous sheet of water, more likely as a web of narrow, braided channels meandering across the flattest low ground. The channels would change and move according to seasonal fluctuations in the water supply. In times of high rainfall they may have formed one great, wide river as witnessed in recent flooding; in drier times the braids would recede, forming pools as they shrank back to trickling streams. The North Kennet Spring, assuming it flowed then, would have been a significant element of Avebury's prehistoric waterscape. It is highly unlikely that the spring would not have flowed, considering its position in a shallow valley sloping S to the river Kennet. The valley is a paleochannel - an ancient natural watercourse that must have existed throughout successive Ice Ages, when rain and snow-melt were shaping the hills and valleys from permafrosted chalk. Water naturally flowed S down the valley and into the river; part of its course just N of the spring shows clearly on Google Earth as a dark stripe, curving across a bare field of chalky soil. Today, rainwater from the valley still makes its way S into the Kennet, apparently through underground pipes. Remnants of a former overground course can be seen: just W of New Cottages is a drain channel, now dry, that once ran S beneath the A4 and alongside the old brewery buildings. A footpath following the drain's course still exists; when the water table is exceptionally high, springs appear along its length and flow overground into the river. The course of the WKA, if it was continuous, would pass directly through where the North Kennett Spring is shown to rise on the OS map. One of OGS Crawford's hypothetical stone positions (68B) is almost exactly on it. If the water table was higher in prehistory, as widely believed, the spring may have risen further N, which would have made the area even wetter. This may explain why there appears to have been a missing section of avenue. Could it be that rather than a continuous avenue running from the henge and terminating at the Sanctuary, there were two separate avenues, from the henge and the Sanctuary, both terminating at the North Kennett Spring? If Twining was correct, the Sanctuary may even have had another avenue terminating at the river Kennet. What was the function of avenues? Since Stukeley's vivid description of Stonehenge in 1740 there has been a general assumption that avenues must be ceremonial routes used for religious processions. Yet archaeological surveys of Stonehenge and Avebury have concluded that few people, if any, walked the actual avenues. Since 'hollow ways' develop so easily in chalk, hollowing of the avenues would be expected if many people were processing over time - none was found. (refs) Stukeley even described Stonehenge's avenue as being slightly raised "a little above the level of the downs". Features described as 'avenues' have been found at other monuments around Britain, particularly henges. The avenues frequently run downhill to terminate at rivers, but not all are like Avebury and Stonehenge. Marden and Durrington, for example, both have far shorter avenues that do appear to have been meant for human traffic, since they were metalled with gravel and stones, and have been compressed. Perhaps our understanding has been hampered by the terminology and not all 'avenues' had the same function? If avenues such as those at Avebury and Stonehenge were not meant to be walked, what was their function? It could be argued that avenues resemble rivers, in that they generally 'flow' downhill to meet an actual river, sometimes accompanied by springs and marshland. The river and avenue frequently form an east-south confluence - this was seemingly a significant factor in the siting of monuments. In its southeast course from the Avebury Henge, the WKA elegantly 'flows' around the contours of Waden Hill; Stukeley marvelled at its harmonious relationship to the landscape. The avenue's route is essentially riverine, even though its gradual descent is interrupted by two ridges. Could avenues be symbolic rivers? In European mythology there is a long tradition linking rivers to the Otherworld, or Underworld; water is regarded as the boundary between the worlds of the living and the dead. The Indo-European myths were already ancient when first recorded around 900 BC - perhaps they contains remnants of beliefs held the monument builders? A common theme is of journeying to the Otherworld by travelling along, or crossing, a river. In Greek mythology Hades is portrayed as a marsh watered by a confluence of five rivers, of which the best-known is the river Styx. In a monument where funerary rites were performed, an avenue may have functioned as a 'river of souls' like the River Styx - a route for the souls of the dead to travel to the Otherworld, as symbolised by a marsh. Marshland is 'liminal' in that it is between wet and dry; it is not quite water and not quite land. Liminal places such as marshes, boundaries and crossroads have a long association with the Otherworld. Being liminal, they are places where two worlds meet - the worlds of the living and the dead. If the Kennet, the Avon and other rivers were regarded as sacred in prehistory, as has been suggested by several archaeologists, then they may have been used in funerary rites for the disposal of bodies or cremations, as the Ganges is today. This raises several questions. Why should it be necessary to create an south-flowing artificial river a mile long, when the real River Winterbourne ran parallel just a short distance away, on the western side of Waden Hill? Why not just build a short linking avenue from the Henge to the Winterbourne? It may have been that east was regarded as more auspicious than west; or perhaps it was important to connect the avenue to the south entrance (or perhaps 'exit'?) of the Henge. It may be significant that the avenue joined the Henge close to where a huge posthole was found. This may be a Mesolithic feature, similar to the three postholes at Stonehenge dated to 8,000 BC. The WKA's river-like descent from the Henge to West Kennet is interrupted by two ridges in the landscape. A real river would not be able to cross them, but perhaps magical rivers can occasionally flow uphill? The Stonehenge Avenue performs a similar feat before it 'flows' downhill and southward to the River Avon. It eventually meets the river at the site of the 'Bluestonehenge' stone circle, an area that is strikingly similar to West Kennett, with a marsh, a spring and an east-flowing river. Avenues connected to henges are regarded as later features, so there may be practical considerations, in that the avenues had to be sited on the most generally downhill route available. Avebury's Beckhampton Avenue is still perplexing and its exact route remains uncertain. Stukeley reported a course W along the present High Street, of which two traces have been found. The avenue is believed to have then crossed the river Winterbourne and continued SW in an uphill arc to terminate at the Longstones Enclosure. Stukeley's claim that it went on downhill to terminate at Fox Covert is still upheld by some, despite the lack of evidence. Excavations in 2003 confirmed part of the SW route to the Longstones but could find no traces beyond there. (LOTM, 57-119) If avenues really do terminate by flowing downhill to marshes and springs, then the Beckhampton Avenue should perhaps be considered in reverse - it begins, rather than terminates, at the Longstones Enclosure and flows downhill to the River Winterbourne, close to its confluence with the River Oslip. Before river management, this too was almost certainly a wide area of marshland.